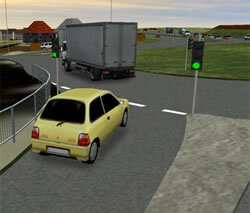 S-Paramics is a software for creation of microsimulations of the traffic. The program features analysis and visualization of the traffic on roads and crossroads, as well as on big street networks. Unlike the macromodels of the traffic in which general streams of vehicles are applied on the street network, the microsimulations are generated taking into account the behaviour of every single car. The software can calculate the exploatation values of particular plans for the organization of the traffic and provide visual evalution by 3D visualization.